Essentially—and some might argue for either better or worse—iTunes is a file manager. In fact, I usually will tell people to just forget about the files. Let iTunes deal with them. Most people will never need to examine the files inside the iTunes Media folder. OTOH, I do all kinds of twisted things to tags and metadata and I often need to know how that may have affected the location of a file. Or sometimes I’ll need to know if a file is where I think it is or is still named what I thought it was. This information isn’t handily available (although some Smarties will copy the file path to the Comments tag so it is viewable in the Comments column in the browser window). You can reveal a track’s file using iTunes’ “Show in Finder” command or see its file path in the Info window’s File tab, but this uses up valuable finger time. And the Info window is modal; you can’t run scripts when it’s visible. So I made this simple stay-open applet that will monitor iTunes and display the file path of the single selected track. The window is resizeable horizontally and the text is scrollable. 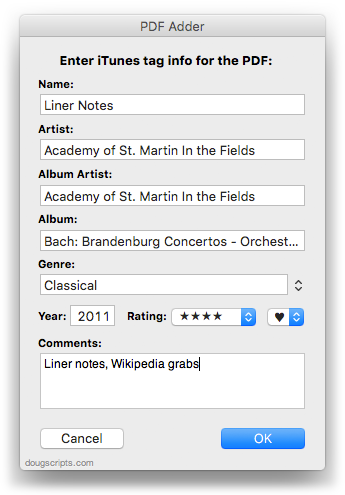 The Display File Path window will float alongside iTunes and whenever a single track is selected—and its file is accessible—the file’s path will be displayed. The displayed file path can be copied as text to the clipboard and the file can be selected in the Finder. There’s also an option to show the file paths of each playing track instead of the single selected track. Obviously, it’s only useful for occasional special jobs but I’ve been finding it handy when the need has arisen. It’s free to download and use with a donation nag and is available here. I think I finally licked a text encoding problem with Music Folder Files Not Added in this latest version. Includes options to Filter results, Add a selection of found files to iTunes (Mobile Applications can not be added this way), move them to the Trash, and Export a text file listing the file paths. Several users had been reporting issues with text encodings (especially with Greek, German and Cyrillic text, but others also) and this version addresses this problem. More information and download is here. Music Folder Files Not Added v5.0 will list the file paths of the files in your designated “iTunes Media” folder which are not in iTunes’ track library. The files listed in this screenshot are in my iTunes Media/Music/ folder but are not in the iTunes track library. In my case, this iTunes Media folder is used by two different iTunes installations on different partitions, so it is also possible that these files are added as track entries in the iTunes on the other partition. However, it is not uncommon to delete the tracks from iTunes without choosing to Trash the files. Additionally, you can select a different parent folder and its contents will be compared to the iTunes library. Includes options to Filter results, Add a selection of found files to iTunes (Mobile Applications can not be added this way), move them to the Trash, and Export a text file listing the file paths. This latest version includes PDF, Mobile Application, iTunes LP and iTunes Extra files when used with iTunes 12.2 or later; adds a Filter option to show only file paths containing entered text; has general performance tweaks. Music Folder Files Not Added is free to try for 10 days and is $1.99 thereafter. More information and download is on this page. 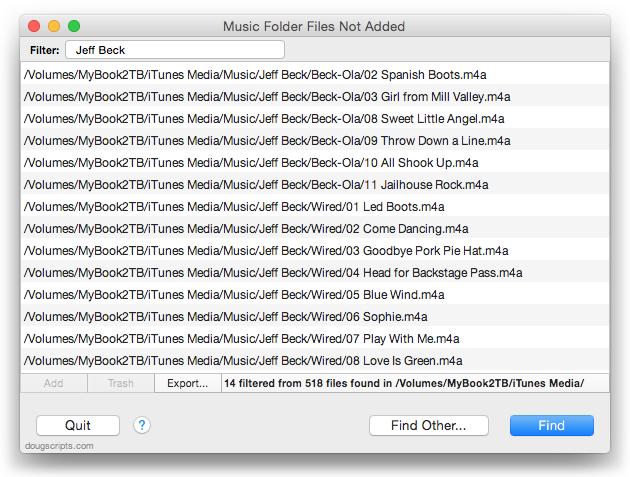 Music Folder Files Not Added will list the file paths of the files in your designated “iTunes Media” folder which are not in iTunes’ track library. Additionally, you can select a different parent folder and its contents will be compared to the iTunes library. Includes options to Add a selection of found files to iTunes, move them to the Trash, and export a text file listing the file paths. This latest version accommodates some changes in iTunes 12.2 and provides preliminary support for OS X 10.11 (El Capitan) beta. 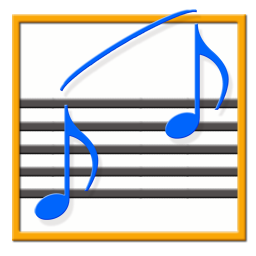 Music Folder Files Not Added is free to try for 10 days, $1.99 thereafter. This is a free update for registered users. More information and download is on this page. Convert and Replace will convert the selected tracks using an encoder chosen on-the-fly (the encoder’s current Preferences-set options will be in effect) and replace the originals throughout the playlists of your entire library with the newly converted versions. Additionally, you can opt to Trash/delete or keep the original files and tracks. Previous Scripts of the Day. Subscribe to my RSS feed or follow @dougscripts on Twitter to get daily “Script of the Day” notifications. 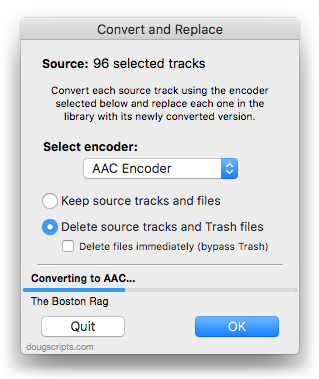 Convert and Export will convert the files of the selected tracks in iTunes using an encoder of your choice on-the-fly (restoring your Preferences-set encoder afterwards). The newly converted files are then moved to a new location of your choice, and their tracks removed from iTunes. More info and download is on this page. Add as PDF to iTunes is a PDF Service workflow that, when installed, will be available in the PDF pop-up menu of the Print Dialog. It allows you to save the current document as a PDF file (from any application that uses the Print Dialog) and add it to iTunes. PDF Adder is an applet/droplet that will let you choose or drag-and-drop an existing PDF file and add it to iTunes. It can be installed in iTunes’ Scripts folder for easy access from iTunes Script menu. Anything you can print, you can make into a PDF…and any PDF can be added to iTunes. 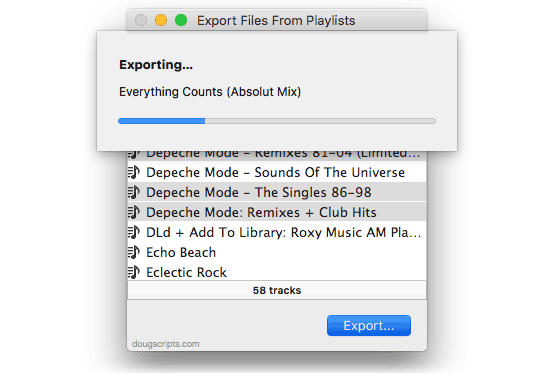 Export Files From Playlists will export copies of the files of the tracks in two or more playlists to a single user-selected folder. In the screenshot above, the files of the tracks in the selected playlists, “David Bowie” and “Little Feat”, are being copied to a previously selected folder location. Track CPR will assist with associating replacement files with a batch of dead tracks. iTunes can perform this task, too, but only one track at a time. The script will attempt to locate existing files (recursively) in a user-selected folder that have the exact same filenames and extensions as the missing files of a selection of dead tracks. Then, you can determine if the found files are viable replacements for the missing files and the script will perform the replacement. In the screenshot above, the blue-colored files have been selected to replace the missing files of the corresponding set of dead tracks. There is information in the accompanying Read Me that you should read. More information and download is on this page. 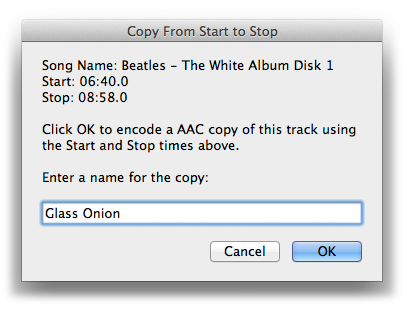 Copy From Start to Stop v2.1 makes a copy of the selected track using its Start and Stop times as the beginning and ending of the new file and adds to Library, with option to name new track/file. It’s handy for creating a new file from a portion of a larger file. Works as a fine companion to the script Player Position to Start or Stop, which sets the Start or Stop time of the currently loaded track to the time of the paused player position. This latest version is a general maintenance update because it may have appeared damaged on recent operating systems. More info and download is here.